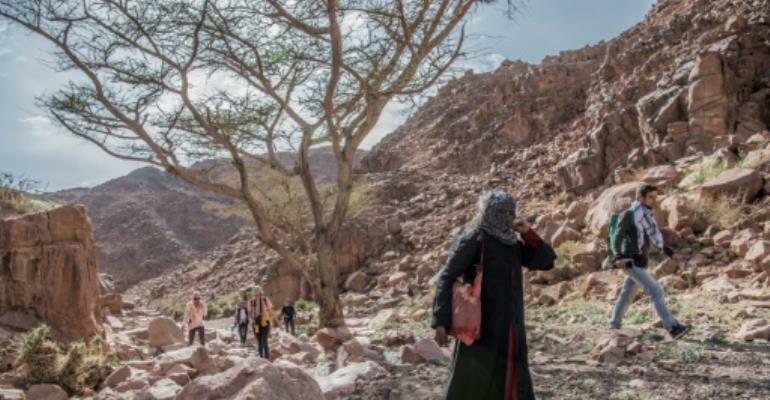 Not so long ago, the sight of Umm Yasser clad in a black abaya leading hikers through the intricate trails of the majestic South Sinai mountains would have been unthinkable. But now, along with three other women from the Hamada tribe, she is a guide for "Sinai Trail". 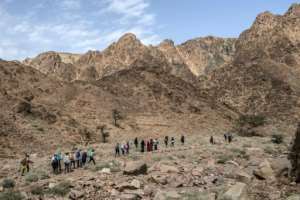 Since 2016, the community-backed organisation has been working to bring hiking as a sustainable form of adventure tourism to South Sinai. In Wadi Sahu, a village made up of humble shacks with corrugated iron and recycled scraps, Bedouins are banking on the return of tourism after the tumultuous years since Egypt's 2011 uprising. "The women in this village don't have jobs, this is the only work out here," said Umm Yasser. "I hope more and more tourists come," said the 47-year-old Bedouin sporting plimsolls to navigate around rocky shards. Egyptian tourism took a massive hit after a Russian plane that took off from the Sinai was bombed in an October 2015 terror attack that killed all 224 people on board. North Sinai itself is a flashpoint of deadly violence between security forces and insurgents. 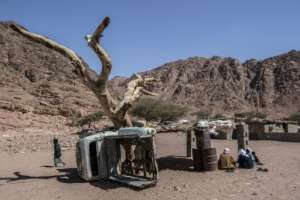 But the violence has not dissuaded a steady stream of avid hikers from heading south to take on the challenge of the desert and mountainous landscape. Ben Hoffler, a founder of Sinai Trail, said the number of hikers has gone up from 100 in 2016 to 1,000 last year. At the launch, "we had three tribes joining the organisation along 220 kilometres (130 miles) of hiking trail," he said. "Today we have eight tribes and 550 kilometres," said the Londoner who has been living in Egypt for more than a decade. 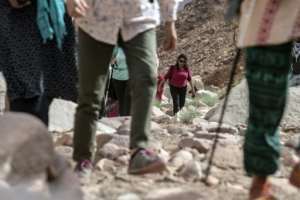 The Sinai Trail cooperative, while respecting Bedouin customs, has since March moved on to women-guided hikes for all-women groups. "It's a historic step," said Hoffler. For the first time, Bedouin women last month led a group of hikers through the territory of the Hamada tribe. Theirs is the only one of eight tribes in South Sinai to have agreed so far for women to work as guides. At the bend on a path, Umm Yasser stopped, grabbed a bunch of twigs and lit a fire to heat up some tea as she recounted tales of how she lived as a child in the mountains. "These are the best guides possible," said Tootsie Saada, 55, who works for a development agency in Cairo and took part in a trek. "They are so lively, funny and curious." Sinai Trail's four women guides had the blessing of their husbands to start their new jobs on condition they return home every night after work. "We have been doing the Sinai Trail for five years now. Up until this point, 100 percent of those working on this trail were men," said Hoffler. "Men in Sinai obviously know it very well but they are only half of the Sinai." Ibrahim Mosalam Ghanem, a 40-year-old male guide who has been leading groups for the past two years, explained that shaking up centuries of cultural tradition presented its own challenges. "As Bedouins, we have traditions and we respect them," Ghanem said, stressing that he would "never accept" his wife working with a mixed group. Hoffler told AFP it took five years to negotiate a deal for women guides, and he is looking for more women to sign up with tribal consent. "I support this work that the women are doing," said Eid Auda Ali, 53, the husband of one of the four women guides with Sinai Trail. He said it brought much-needed "extra income" to an area where livestock and mining are not enough to support families. Having seen the positive results, Ali who belongs to the Muzeina tribe in Sinai's far south wants others to follow in the footsteps of the Hamadas.